Contact us today at 704-522-9026 for Christian counseling in Charlotte, NC or to attend an event, or use the form below to send us your information. 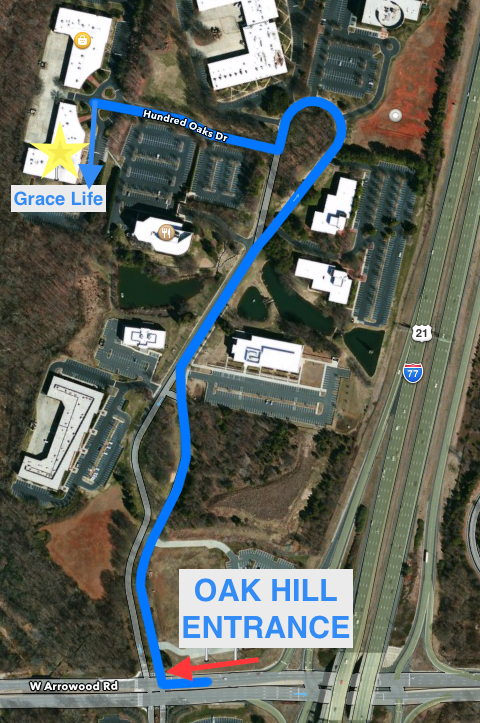 The headquarters of Grace Life International is located in Charlotte, NC. Our office offers a wide range of services for Christian counseling Charlotte and the surrounding area. This location also serves as the host for many of our events. We are located in the Oak Hill Business Park, right off of Interstate 77 (Exit 3) and Arrowood Road on the southwestern side of Charlotte. Navigating the business park can be a little tricky on your first visit. Please refer to the aerial map of the business park on the right and the Google Map below for directions.